Well, I had a challenge today! I found out about a new nest and went exploring. It was easy to find but not easy to access. I viewed it from quite a distance and I quickly determined it had two banded birds on it and at least two chicks. Now, how was I going to get close enough to this nest to read bands? I drove around the area, driving into some private property to speak to residents to see how I could get closer. "What kind of nest? What is an Osprey? " So I did a bit of educating. You all know about my band reading challenges this year, I am still behind, and at this time of year it's critical to get bands read and not save them for later. There may not be a later....if nests fail, as some have, without us getting those bands read. Adults can disappear leaving us without important data. I finally discovered that a power company was doing some work in the area and had set out that dura base material to make a road over soft ground...and they allowed me to drive out to get a better view of this nest. I watched for over six hours to get these bands both read! This time of year is difficult because the females rarely leave the nest. They remain in the nest with the young chicks, feeding, shading and tending to their care. I got the males band read fairly quickly, but that female kept me there all day! I can't stand an unread band! She remained in the nest where I could not see her legs. The upside of this frustrating experience is that I am forced to sit and watch the behaviors for long periods. This devoted male brought NINE fish in six hours!!!! They were quite small and most often were goldfish! This guy rarely stopped to rest, perch, preen....he was delivering fish constantly! He was a male I had known earlier...he nested elsewhere for several years and disappeared a few years ago after a series of problems...storms, eagles etc. I have been looking for him and was so happy to see him again with a new mate and a very nicely built nest in a lovely setting. When I got closer I was able to see that he has three chicks...all very well fed, with bulging crops all day long. Towards the end of the day the female finally took a little break and flew to another spot to perch and preen, away from the chicks and I was able to read her band. I had planned to visit many nests today but only got three checked since this new nest required so many hours to get the important info. I found another nest failed and we had not been able to get that female identified. It almost kills me to have to write "unknown" in the chart under the band number column. Even worse to not know why the nest failed. But I have to accept that I just cant do it all, and I should be pleased that I got all the important data on this new nest. I also met new people and was able to share some information and stimulate some interest in Ospreys in these people who live near this nest. Special thanks to the person who let me know about this nest. We rely on the public to report new nests to us and so deeply appreciate it when people do find me and direct me to a nest I was not aware of. We have had several reports like this lately, and I am so grateful to these people! The population is booming! There have been some ups and downs in the osprey world. Sadly I discovered a dead chick hanging from the edge of a nest, tangled in baling twine. It is so disturbing to see. We try to get the word out about the dangers of baling twine but I am afraid that the people who need to see it, are not reading my page. I imagine it is a miserable way to die. On a happier note I visited the nest of our oldest male and was thrilled to see that he has two chicks in his nest! We have never had a male that old breed successfully. In fact we have noted a drop in productivity in some older males, which may reflect a drop in fertility. At any rate, I continue to be pleasantly surprised by our 23 year old males robust nesting activity. He is often near the nest, and providing well for his family. A new record has been set! We are continuing to work hard on gathering our early chick counts so we can monitor mortality rates. There seem to be many large three chick nests, tho the nest failures are mounting as well. So far the failure rate is not abnormally high but every week I seem to find another nest or two empty. Some pairs have simply given up on eggs that are infertile and therefore not hatching. At some nests I have seen evidence of hatching /feeding and later find the nest empty, with no idea what caused the chicks to die. I am still working on getting the remaining bands read. I did get a few difficult bands read last week and hope to get a few more challenging ones this week. I spent 3.5 hours at one nest trying to get a males band read! He is such an attentive male that he is always standing in the middle of the nest, watching his offspring, where I cannot see his band! But he finally cooperated with me a bit and by watching closely between the sticks, I was able to identify him. I have a few more of those to go and may have to devote an entire day to get those final bands read! I never give up! I often learn a lot about behavior and the personalities of the birds when I spend long periods there trying to get a band number. I have been doing the early counts of chicks on nests. We like to count as early as possible so we can document mortalities along the way, tho some have surely occurred before we are even able to see the little guys. My high powered scope is very helpful in these attempts. The experience I have acquired over the years is also helpful in peeking between the sticks, watching for subtle movement and good old patience is required! I noticed many years ago that there is a phase the chicks go thru at approximately two weeks of age when they do peck at each other. Perhaps it is a way to establish "pecking order"! 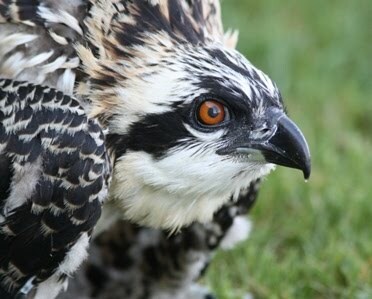 On most nests it is not seriously aggressive and siblicide is rare with Ospreys. On some nests, it can become more aggressive. I have not seen that in person but have seen it on some cams. Most osprey researchers maintain that the adults will not intervene in these sibling squabbles. And up until yesterday I would have agreed with that. I was watching a nest with three chicks in it, and the largest chick was repeatedly pecking at both siblings. At first the female just watched, even moved away to the nest edge and then she suddenly moved back into the middle of the nest cup and stuck her beak out, as if she were feeding, but she had no fish and she tapped the bully chick on the beak with her beak. Then she pulled back. The chick began pecking again, and again, she moved into the nest cup and reached out with her beak towards the aggressive chick. She repeated this action over and over until the chick ceased its pecking. I have never seen anything like this, and it was very clear she was responding to the chicks behavior. I won't project meaning or pretend to know what her intention was, but her behavior seemed to successfully distract him from his aggression. Do these behaviors happen when the chicks are hungry? Shortly after that, the male arrived with a fish and she fed them all. I watch all these subtle behaviors with such interest. I remain curious, still learning. How could anyone ever lose interest in these birds????? How could anyone get bored? Wish I had more days in each week, more hours in each day to watch them. On a different note, I am happy to say that more nest checks have so far shown no other losses from the big storm last Sunday. Today I visited several nests on very high transmission towers, including one that has collapsed during storms in the past, and all were fine. Adults were feeding chicks even tho one nest was a bit ragged around the edges. I am relieved. I am busy checking nests after the storm that came thru on Sunday. Sadly, there were losses. I had watched three beautiful chicks bopping around on one nest last Saturday, but now, there is only one. This nest was in an area hit hard by hail. I think of what that poor female went thru to survive the storm herself....she took a beating for sure...and she probably couldnt adequately cover three chicks, and the piles of hail probably also caused them to get too cold, in addition to the potential injuries from the impact of the hail. So the fact that she survived and she saved one chick is amazing, and for that, we must be grateful. I am sad tho. Then I found another nest in that area, that had just recently hatched tho the chicks were too small to count, had totally failed. Both adults survived and were seen perching and eating elsewhere. The male even brought a stick, indicating he might build a frustration nest. This is the male who had two nests last year. Now he has none. Perhaps he will rebuild that second nest which may result in another case of polygyny next year! The drama goes on. I am worried about so many other nests, and they are predicting severe weather again tonight. I cannot check 125 nests everytime there is a storm. I will try to make my way around to the areas that seem to have been hit the hardest. The nests in my neck of the woods were all fine. This is nature. These increasingly severe storms are also the result of climate change... six inches of hail on the ground that required snow plows to clear in June. This points to one of the reasons that continuing this research is important. Ospreys are an indicator species, and what happens to this species reveals much about our environment. The health of their population, their productivity rates are important to monitor. I keep trying to move forward with this study, tho we face resistance, and lack of cooperation all the time. Thanks to all who DO help me, who still care, who help me watch over these birds, who offer financial support, who see the value of this long term study. My gratitude cannot be adequately expressed. All is well at the Arb after our morning storm.....wild for a short time. Hail, strong wind, but it passed quickly. Chicks are fine and poor Mom survived the beating. I was out checking nests and it got so dark and ominous that I hurried home. I will probably head out again and check a few nests. I think it's clear now that the third egg in the Arb nest will not hatch. I believe that actually was the first egg laid. The egg was probably infertile. Remember that frequent copulations are what is required to fertilize the egg...and at the beginning Mr Z3 was spending some time at another nest, so the timing of copulations may not have been effective in fertilizing that egg. We are happy to have two healthy chicks tho. It will be interesting to see what the adults do with the egg. Sometimes they bury them in new nest material. I am worried about some nests in more precarious locations and I will continue making the rounds as possible and hope that the nest monitors will report their observations.....some already have. So far, only good news! I visited 22 nests today....trying to primarily focus on those nests where I had not yet confirmed hatching. Five of those nests were still incubating with no clear signs of hatching yet. Sadly, two of those nests had failed. In one case, hatching had been confirmed but now the adults were not tending to chicks and the male even tried to copulate with the female. That is a sign that they know something has gone wrong and they want to try again, start over. It's too late for that and the female did not seem cooperative. I don't know what happened to the chicks. At another nest, I had never confirmed hatching, and now the adults were gone. Sometimes if they incubate too long, they realize the eggs won't hatch and just give up. I have often seen females give up first and I noticed that on yet another nest. I did not label it failed yet, but they are overdue and the female was on the nest perch food begging while the male incubated. He would not get up. We will see what happens. We have at least seven nests that have failed around the metro, and I am sure there will be more. This is a natural part of breeding. Eggs may be infertile, or they may have died along the way. It is much sadder when chicks die, and I am sure we will have that happen this year also. Meanwhile, we focus on the successes. I was able to count the little guys on a few nests and found a few nests with a "full house" of three chicks. After all these years, it's still a warm, fuzzy, joyful feeling to watch the wee ones, with their heads falling over, the older chicks starting to notice a world beyond Mom and Dad...looking out at their surroundings. Nothing cuter....life going on. They grow so fast...to 80% of their adult size in the first 30 days. I am a bit worried about these newly hatched chicks as we face a brutally hot weekend here in Minnesota. Temps are expected to hit the upper 90s, with high humidity. Newly hatched chicks cannot thermo regulate, so very hot or cold weather can be very hard on them. I hope the adults keep them well hydrated and shaded. Fingers crossed that they all survive the weekend. I get too busy checking nests and have difficulty finding the time to write a post! My apologies to the readers. We have many nests hatched now and I observe so many interesting behaviors during this phase of breeding. Today I was watching a female incubating when the male arrived with a fish. She did not get up to grab the fish so the male started walking in circles around her, his head low and cocked to the side as if he was trying to get a peek beneath the female. He went around a couple of times, looking for a glimpse of those chicks! It was endearing. She finally stood up and grabbed the fish and began eating and finally feeding the chicks....leaning into the nest cup with tiny bits of fish. The male then went down into the nestcup and adopted that position that many people call "mombrella" , wings out to the side to create shade as the female fed the little guys. What lovely teamwork! Those are some lucky chicks! This male has now made it onto my "favorites" list. I am seeing a lot of feeding behavior and some males do get quite involved, feeding the female and then she feeds the chicks. All of these observations are the reward for watching what may appear to be "just incubating". We cannot see the little chicks until they are ten days to two weeks old usually, so brooding chicks can look just like incubating eggs. There are some differences tho. It takes patience and perseverance to wait for something to be revealed. There is always so much going on and so many subtle behaviors to watch. I have been noticing that after rolling the eggs they usually turn a bit before settling back down into incubating posture, and it is most often a turn in a counter clockwise direction. I also notice how they rest one side of the brain by closing the opposite eye for brief periods. One eye quick naps. There are so many things to observe and make notes about. After 24 years it is never boring to me, and I have a hard time tearing myself away. But with so many nests to watch, I do have to keep moving. I have been able to read some of the most difficult bands, on nests I cannot get very close to and am feeling a sense of accomplishment about that after the scope fiasco. This, too, takes a lot of patience, multiple visits, the right light, a cooperative bird. Success is rewarding! Still some bands to read however! We are finding new nests during our rounds....the population is booming. I can't help but wonder how many I am missing....so please, readers, and birders, please do report new nests to us. Don't assume that we know about them. Maybe we do, but I don't want to miss any nests. We are trying so very hard to do an accurate and complete survey of all nests in the eight county metro area. Some of you may be wondering about the male who has had two mates at two nests the past few years. Last year when his primary nest collapsed from the transmission tower, I suggested that may put an end to his polygyny. I was correct. He did drop a few sticks on that tower initially, but his effort at rebuilding the nest was half hearted at best and he has settled for being a one nest guy this year. This shows that these behaviors are a result of opportunity, and the strong instinct to reproduce. In spite of all the anthropomorphic stories that can be spun about that....it's just instinct and opportunity meeting each other.